I had a couple of hours to kill in Leeds recently (I was waiting for the lovely wife to have her hair sorted – it seems to take hours on end and it looks the same at the end of it, but don’t tell her) so I decided after a slap up breakfast to combat a hangover and then on to get some culture. I always wonder what people think when they come to Leeds in search of culture and not shopping. It must be bloody hard to find. When the book club boys go to mainland Europe on our annual trips, one of our first port of calls (after the bars obviously) is the art gallery. So I put myself in the shoes of a ‘cultural visitor’ (yes, they do exist) and set about visiting Leeds City Art Gallery and The Henry Moore Institute. 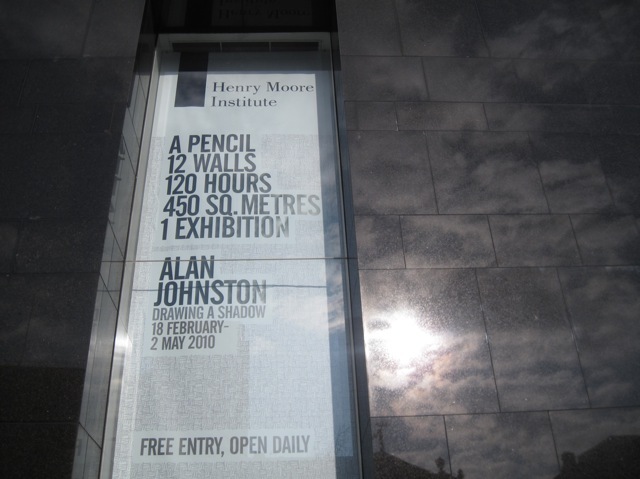 The exhibition in the Institute consisted of a room of 3B pencil scribble on a massive, white, emulsioned space. It wasn’t bad but it seemed to confound all of the visitors who were there the same time as me. Maybe that was the point. The artist was called Alan Johnston, I quite liked it and the artist seemed like he had the worst case of OCD I’ve ever seen. The main gallery has some interesting stuff in there, some old some new but it just seemed like a mish-mash of old stagers and new chancers. I just can’t shake the feeling that art in Leeds is just not taken seriously by anyone with their hands on a serious pot of money, which is a huge disappointment. This city has been working towards a very commercial vision in recent times and I think we’re all the poorer for it – literally and philosophically. In some ways the recession has put paid to some of the more ludicrous plans, and I’m pleased about that. It strikes home pretty powerfully too when you try and spend a couple of hours in the city centre that’s don’t involve shopping, eating or drinking. The city just feels culturally impoverished and although the new city museum is a captivating diversion, it’s aimed rightly at mainstream family visitors. We are still missing a ‘proper’ cultural destination. Look at Manchester’s great old art gallery. Look at The Baltic. Look at Tate Liverpool. What happened in Leeds, and who’s responsible? together in any meaningful way. E.g. no obvious signage (so if you arrived at the station how would you get to say a) the armouies or b) the art gallery or c) the city museum. There could easily be some sort of trail around the city both for walkers and why not some sort of free bus that could bring in say the Thackery or a bus linking the museums to the Sculpture Park.